Educating children at an early age is very important. Based on neurological known that about 25% perkembangan adult brain during the newborn, 50% occurred when the child was 4 years, 80% have occurred when children aged 8 years and reached its peak when the child was 18 years old. The amount of brain capacity is potential and is ready to be empowered, but also can die and not develop if penanganannya not true. 0-8 years of age called 'golden age' (golden age) that is provided the most potential in the development of children's intelligence, because in that age the brain experiencing very rapid development leap. And in this golden age of early childhood education must begin to be applied to children. Early childhood education is very diverse, and certainly will be more effective if accompanied by education in the game, like learning while playing. because the child's age they will easily bored to learn a monotonous, their age is the time to play, not learn, but learn at an early age is very important for the intelligence of children, and therefore there are many ways of learning so that children are not bored with learning, such as below, learning through games. This game will be easy to understand by anak2, because of their age are still rather play than study, and therefore how to keep the child can learn while playing a fun, yes it is a solution like playing Snakes and ladders on top. 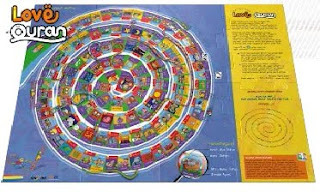 Snakes and ladders game will be very helpful for parents who have difficulty learning to guide their baby, because they are able to learn on their own while playing beramain with their peers without the guidance of their parents, but it would be nice after the children to play, parents are also actively asks, such as "how did it play, can any language, etc." because it will motivate the child. The picture above is just a game of small size, which can be brought where the child likes. But there also are large, so play him as he stood up and stepped on his game board. So much fun to play and learn, what more in vacation time. Anyway, there are also learning while playing with the snake than ladder on top, this .... A doll, as shown below. yahhh .... for the interaction of children walking, such as real as it is in played the same as in the picture, there is a figure in his study. So much fun, anak-anak certainly like to learn while you play like this. Else if anak-anak learning monotone no distraction, it certainly bored .. want to play dengan anak-anak age. 0 Response to "Fun Learning While Playing"